Sometimes it's good to get out of your comfort zone and stretch your creativity. Sticking with the same decor all the time is easy, but it can get stale after a while if you don't change things up a bit now and then. Today I'm venturing out of my comfort zone and loving it. 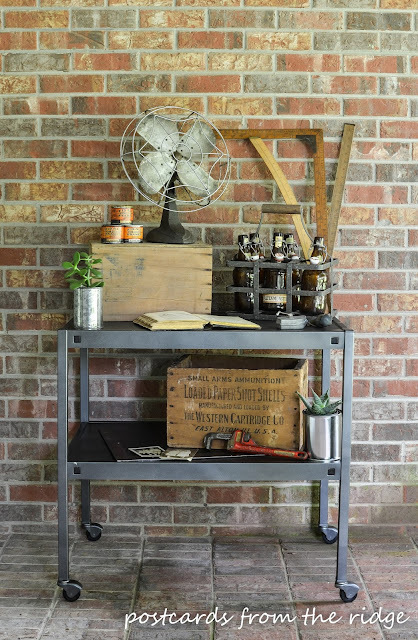 I'm joining my furniture makeover pals in our monthly "Themed Furniture Makeover Day" and this month's theme is industrial. Although I like the industrial style there just isn't much of it in our home. Or so I thought. Since I no longer have a space to sell my furniture makeovers and don't have room for any new pieces in our home, I had to use something we already had AND make it something we could actually use. So this was a real challenge! We have had the cart in the photo above for several years and it has been used for storing things in the basement. It's the most industrial piece of furniture in the house, so it was tapped for this project. Here's what I did to give it an industrial look. First it got a good cleaning with my favorite pre-paint cleaner, Gloss-Off. Next I took it apart and laid it out on some flattened cardboard boxes. 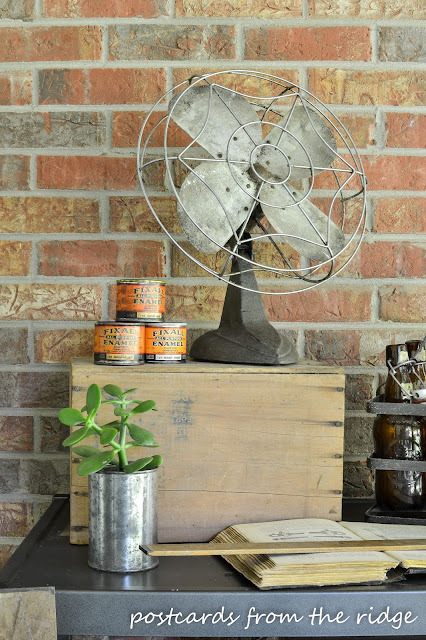 To give it an industrial iron look I simply spayed it with a couple of coats of Rustoleum Metallic Soft Iron (I used 2 cans for this project.) It had the perfect industrial metal hue. After the paint dried the fun part began...styling it. If you ever visited our house you would realize I'm a bit of a collector. Some might say hoarder, but I don't like that word. 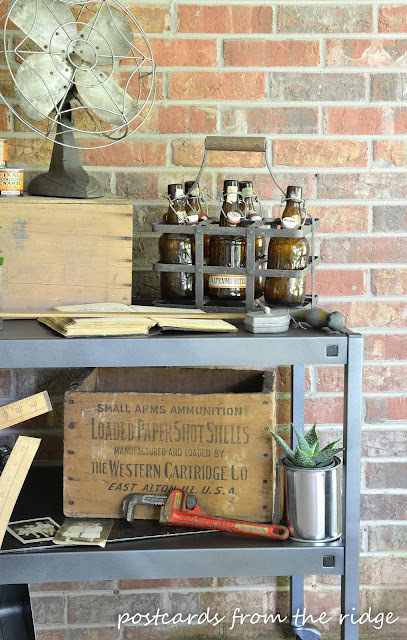 For styling this piece, I went around the house gathering things from my "collection" and found some fun items that would give it an industrial vibe. The vintage metal fan definitely fits the bill. It and the little cans of enamel were stashed in our garage. I just love the vintage labels. 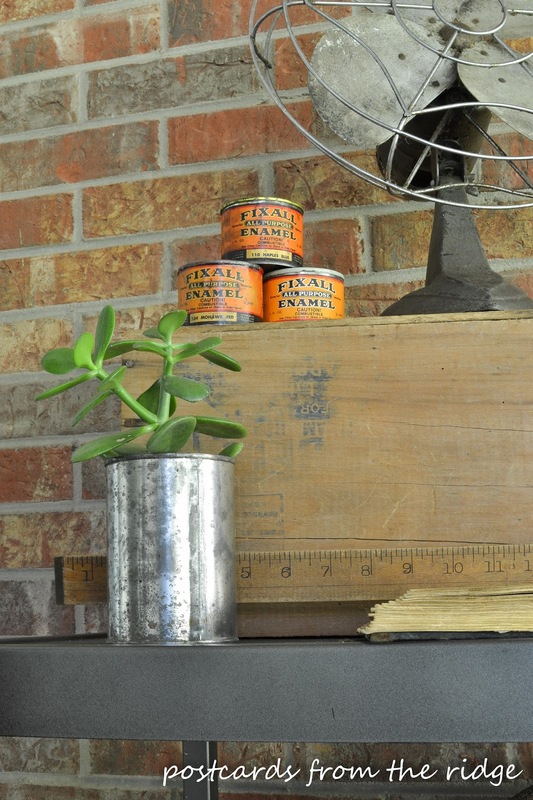 The succulent in the old tin can was borrowed from my youngest daughter's bedroom. She has a really cool vibe in her room. 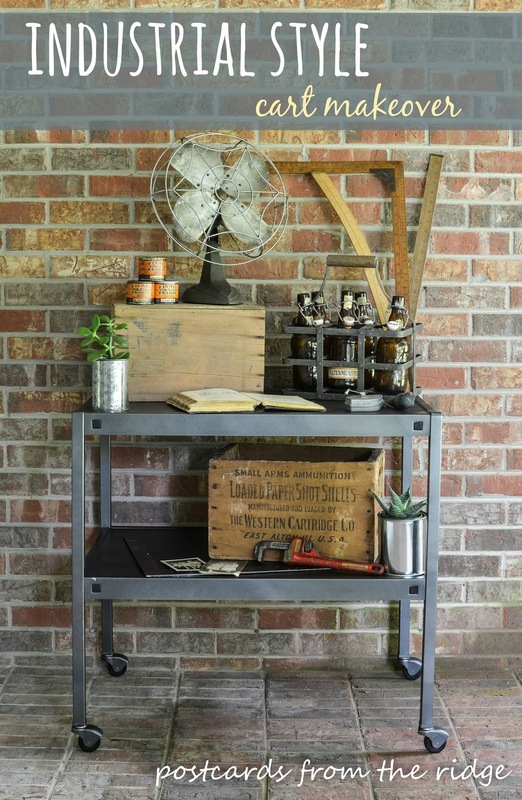 The metal caddy came from the Restoration Hardware outlet store several years ago and certainly has the industrial look. 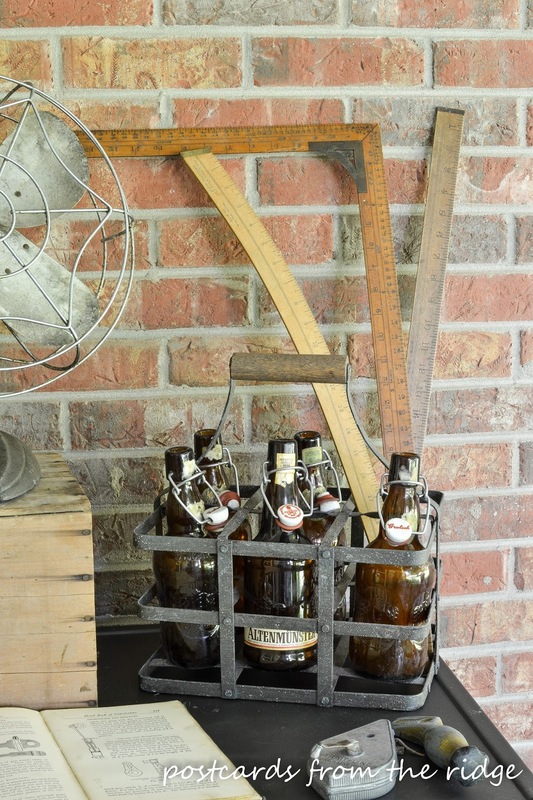 I wasn't sure what to put in it until I remembered these vintage amber German beer bottles. Perfect. Since we're talking industrial here, I can just imagine steel workers from the industrial revolution throwing back a cold beer at the end of their work day. Can't you? I added an old chalk line and utility knife to the cart as well. I grabbed on old red wrench from our tool box for some color. The succulent in the paint can is also from my youngest daughter's collection. The wooden ammunition box came from a tag sale a few years ago. It's over a hundred years old. I love collecting things like that. Do you? 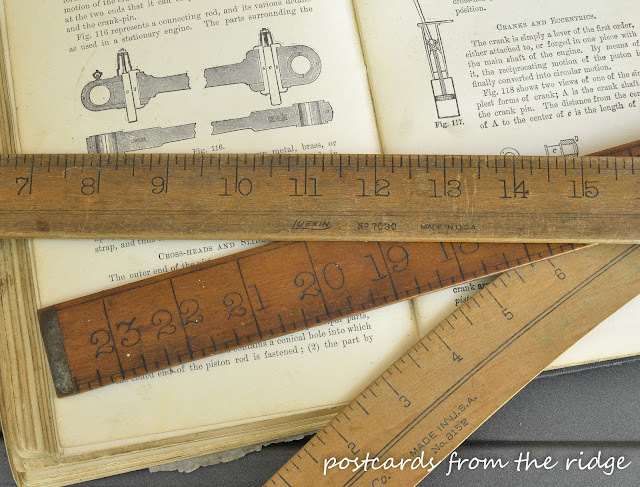 Take a look at the fonts on the numbers of these vintage wooden rulers. Aren't they amazing? I'm not exactly sure how old these are, but they look industrial to me. And the book they're lying on is an old engineering book I got for a dollar or two some time ago. The illustrations are so cool. The ruler on the left has a slight curve to it. Maybe someone with an engineering background would know what it's for but I don't have the slightest clue. Any ideas? The only other things I added were a metal L-square ruler and some old pictures of my husband's relatives. 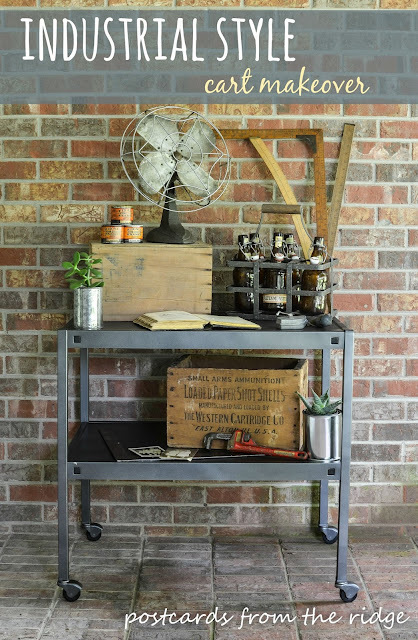 Even though the cart is kinda boring and plain, I think all the accessories really give it an industrial look. 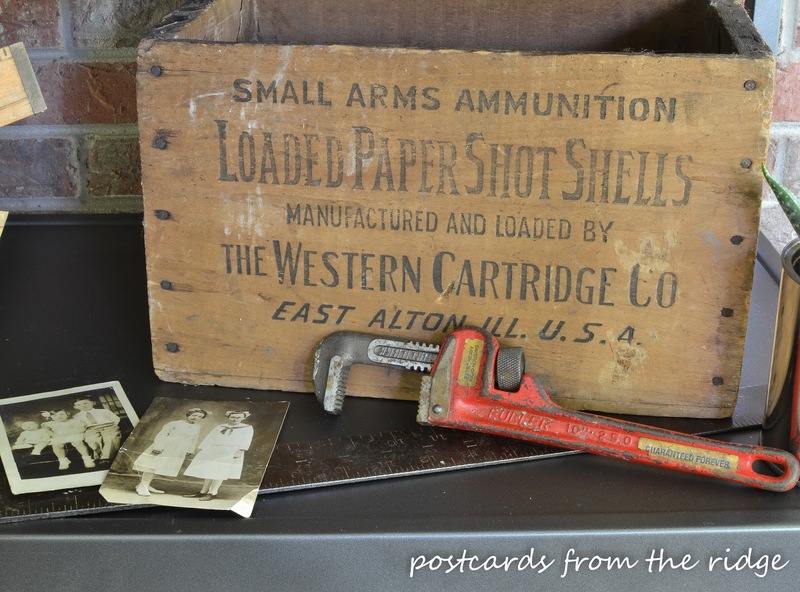 I still can't believe we had all these things scattered throughout the house, mostly in the garage. I think I need to open up a shop and sell things from there. I'm not sure where this will end up in our house. We already have a coffee cart and 2 bar carts. (Collector, remember?) Maybe it can be a cool tool cart for the garage. I'm guessing my husband will use it as a grill cart. What would you use it for? A similar, newer version of this cart can be found here. 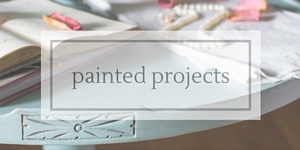 See more of my painted project makeovers here: Painted Projects. Now that you've seen my industrial themed makeover, it's time to visit my uber talented pals and see what they've done. Click on the photos below to see each project. Prepare to be inspired! And here are a few previous themed furniture makeovers if you want even more inspiration. eep! I have an addiction to carts and I love finding them. Great job on giving that tired piece new life, Angie, and your staging is perfection. Eye-candy! Thanks, Larissa. I have an addiction to them too. They're so handy!! Angie, I love your cart and your industrial vibe! Our tastes are so similar. Rustolem is my favorite spray paint and the color you chose is perfect. Thanks Kathy! We do like a lot of the same things, don't we? I think the color turned out perfect for this piece too! Rustoleum is great spray paint. I love your cart and especially love all of your accessories. Our taste is so similar and I poured over each picture looking at every vintage detail. You are so good at styling. That cart is exactly like the carts that we use at school. I'd like to find one to use in my basement, it would be great to be able to roll my supplies from place to place. Thanks Paula! We do have very similar taste. This cart was used for a printer in a previous life and I'm sure they're easy to find. It's extremely sturdy! Love this little table and all your fabulous styling accessories! Thanks Breanna! The accessories are the really fun part! Yes, Christy. It's so functional. And it was a stretch for me on this one but it ended up being really fun to do. What a huge difference a little paint can make and how it can give it a totally different look and vibe. Great redo and your accessories are perfect. Paint does definitely make a huge difference. I actually like this cart now! Thanks Amy. 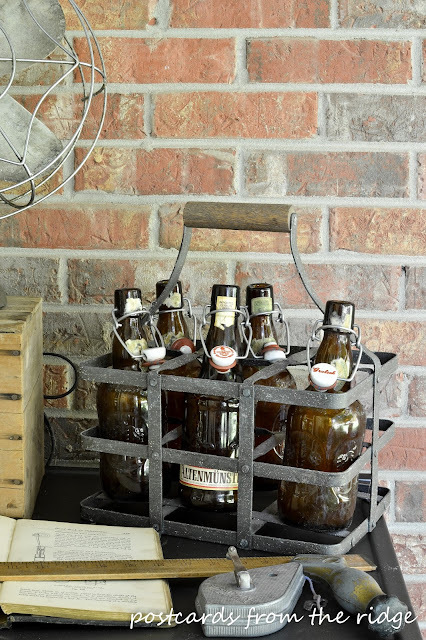 It would be perfect for a beverage station. And one of these days I might part with some of my stash. It's gotten too big for me! Angie a grill cart would be great, but I think I'd have to leave it styled the way you di for this photo! Awesome, awesome job styling it! ...And I agree with Amy... online shop girlfriend! Thanks Nancy! It's definitely fun and functional! Really nice job! 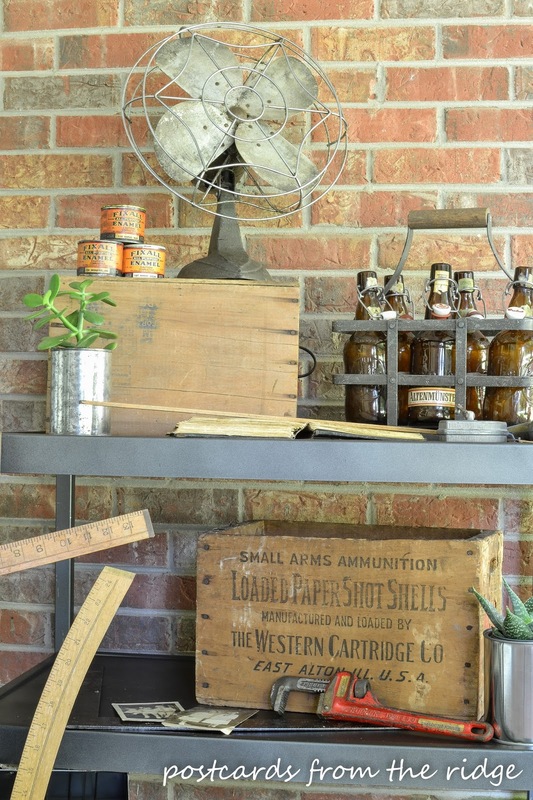 I love seeing old things recycled and saved from the dump! Thanks, Mary! I love giving new life to old things! 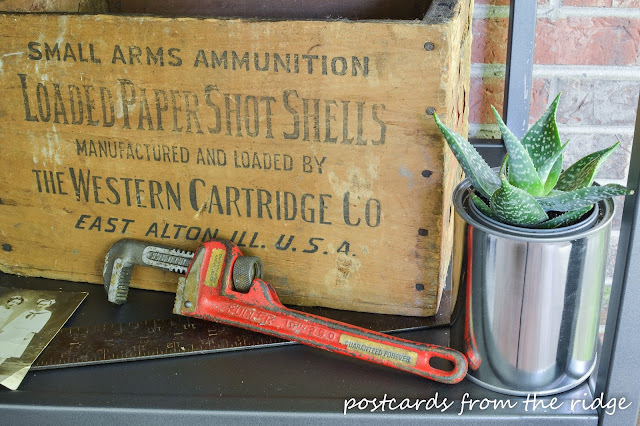 Love your cart and how you styled it -- I think your daughter's little plant is my favorite thing! I'm on the hunt for another cart because I'm a bit of a paint "collector"! Perfect paint selection and styling. Love how your mix of items evokes such a nostalgic vibe. ! Oh, by the way, I think the cured ruler is an old rafter or framing ruler. Thanks Kathy! I wondered what that ruler was made for . I'm using something similar but have yet to do the fun styling!!! On the ugly side of our house where the meters are located. The sidewalk we put in and gate make this area narrow. Our handyman had to move the bottom shelf way up because of our watering system outlets for the six stations. I just don't want to drive by and see nothing!! It's been neglected far too long. Do you have an area. Visible driving down the street but not used to enter your home? I'd use many of your items plus some potting table items too.